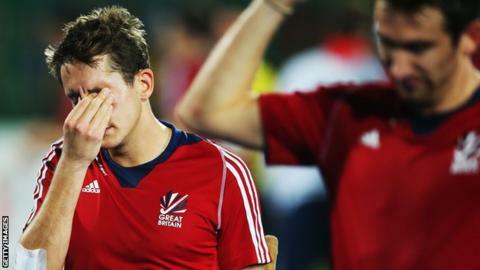 Poor performances at the Hockey World League Finals could be a "blessing in disguise" for Britain's men and women. The men's team finished sixth in India, while the women were seventh in their event, which was won by Argentina. The hosts defeated New Zealand 5-1 on Sunday, with Germany beating China 6-2 for bronze. "Unless people go through these experiences we won't actually be fully prepared for Rio," Danny Kerry, coach of Britain's women, told BBC Sport. Kerry coached the GB women to Olympic bronze at London 2012 and then moved into the performance director role - overlooking both squads - before returning to the women's set-up in 2014. Both teams have since secured places at next year's Rio Olympics, while England's women won a historic European gold medal in August. "We can't lose sight of the big picture which is Rio, so it's probably a blessing in disguise having gone undefeated throughout the summer," said Kerry. "Both squads are actually in really good shape so there's a lot of cause for optimism despite the results at the end of the year." Helen Richardson-Walsh finished as the women's tournament's top scorer with four goals, and also made her 100th appearance for Britain. She believes the team will learn from mistakes in Rosario as they attempt to become GB's first Olympic hockey champions since Seoul 1988. "No team becomes a bad one overnight," she told BBC Sport. "Yes, there are some critical things we need to look at and do better with, but this is an amazing squad and the European success shows what we can accomplish when we get it right." Crista Cullen was the leading goalscorer at London 2012 and was widely regarded as one of the best players in the world when she retired after the Games. After three years working in animal conservation in Kenya, where she grew up, Cullen returned to the sport this year. The 30-year-old missed GB's first two matches in Rosario with a calf injury but performed well against Australia and New Zealand. The Olympic bronze medallist struggled to create breakthroughs with her trademark penalty-corner routines, but insists improvements will come. "I'm still coming back and there are a lot of things I need to work on with my game," Cullen told BBC Sport. "It's important not to get frustrated because things will come together as they did for London. "We could have won this tournament and learnt fewer lessons, but because this hurts so much we will learn a lot from it." After a short Christmas break, the team will regroup for a month of strength and conditioning training in January before a series of matches in Australia in February. Their final major event before the Rio Olympics will be the Champions Trophy in London in June.